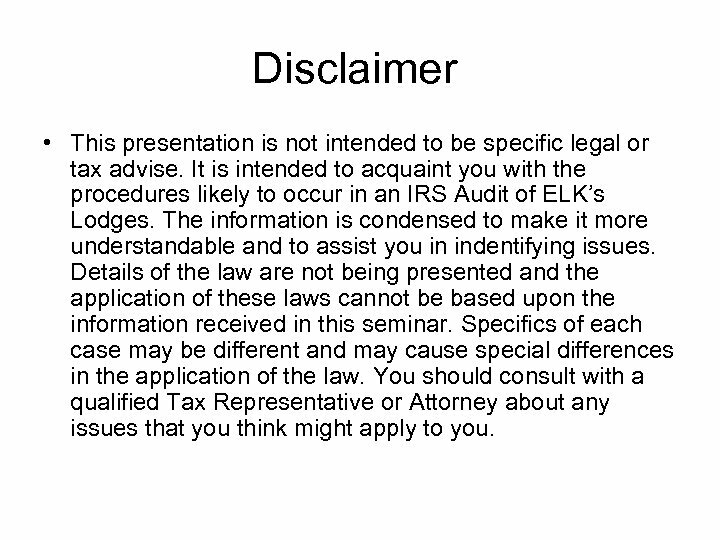 Disclaimer • This presentation is not intended to be specific legal or tax advise. 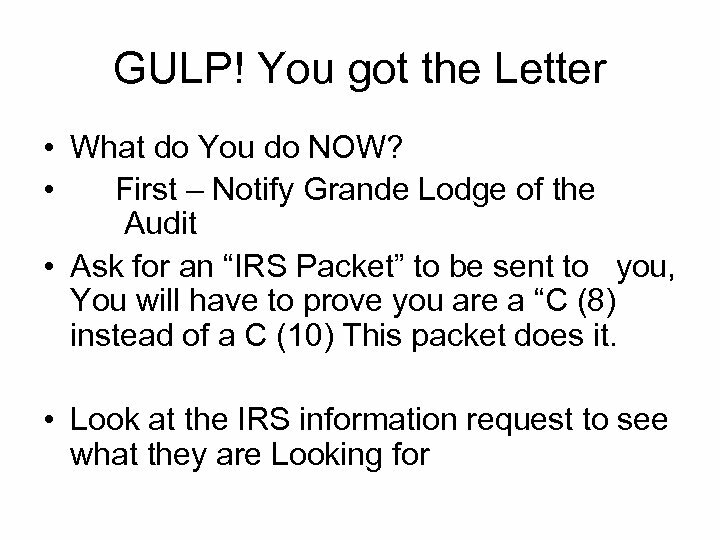 It is intended to acquaint you with the procedures likely to occur in an IRS Audit of ELK’s Lodges. 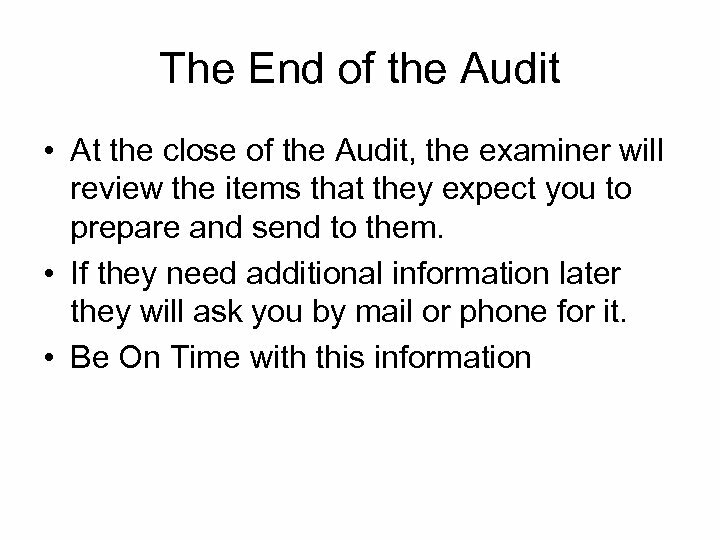 The information is condensed to make it more understandable and to assist you in indentifying issues. 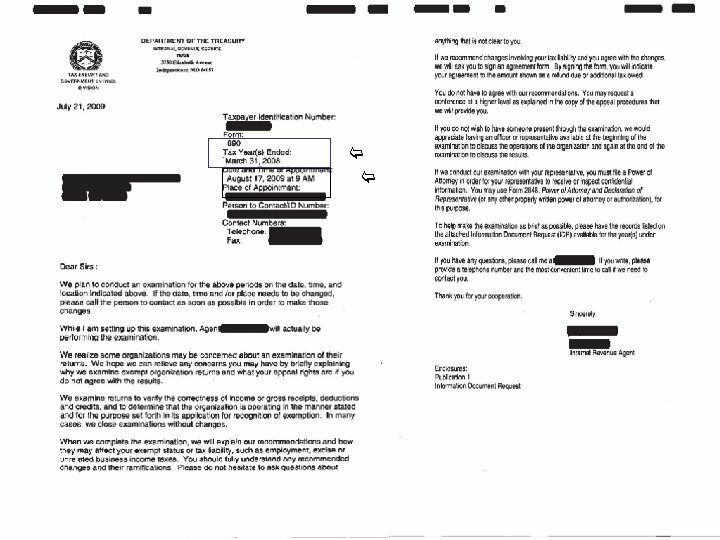 Details of the law are not being presented and the application of these laws cannot be based upon the information received in this seminar. 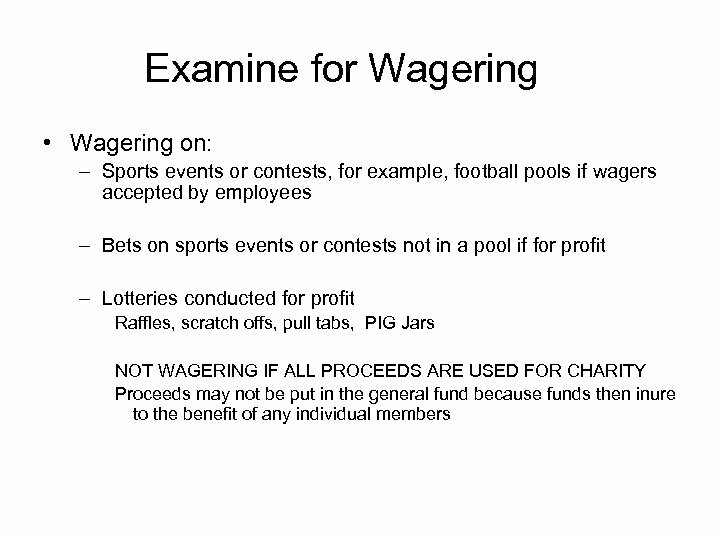 Specifics of each case may be different and may cause special differences in the application of the law. 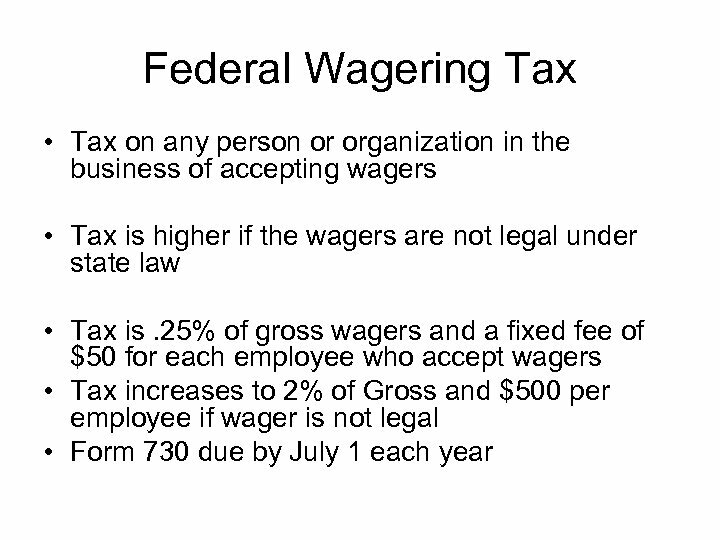 You should consult with a qualified Tax Representative or Attorney about any issues that you think might apply to you. 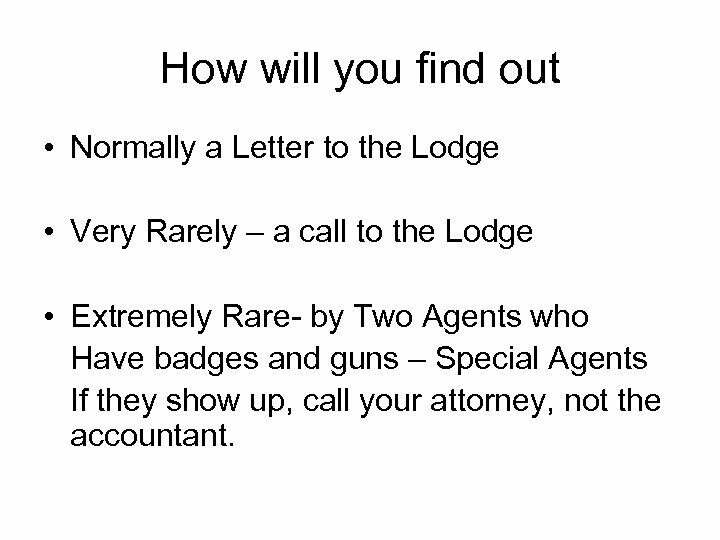 How will you find out • Normally a Letter to the Lodge • Very Rarely – a call to the Lodge • Extremely Rare- by Two Agents who Have badges and guns – Special Agents If they show up, call your attorney, not the accountant. 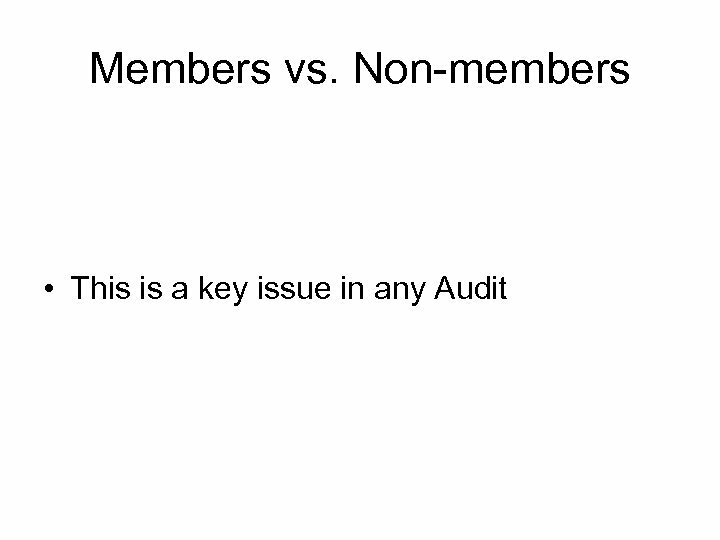 TRAPS In the Interview • Do you have more than one class of members? • Do you give scholarships directly to individuals? 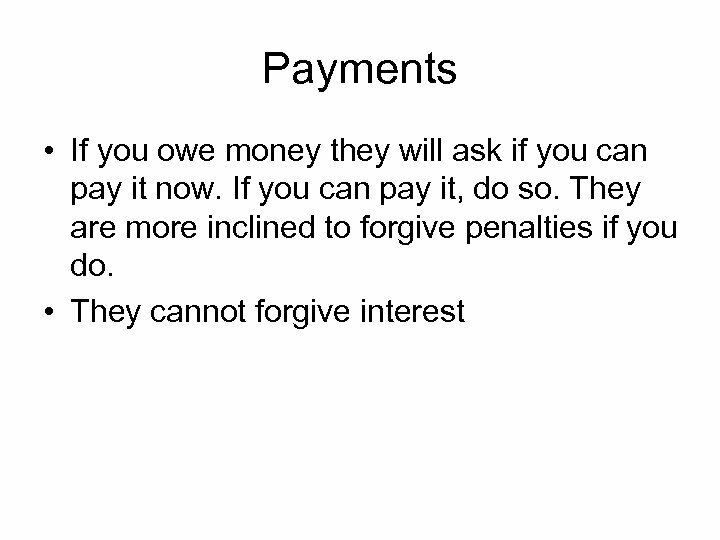 • Do you pay officers or trustees? 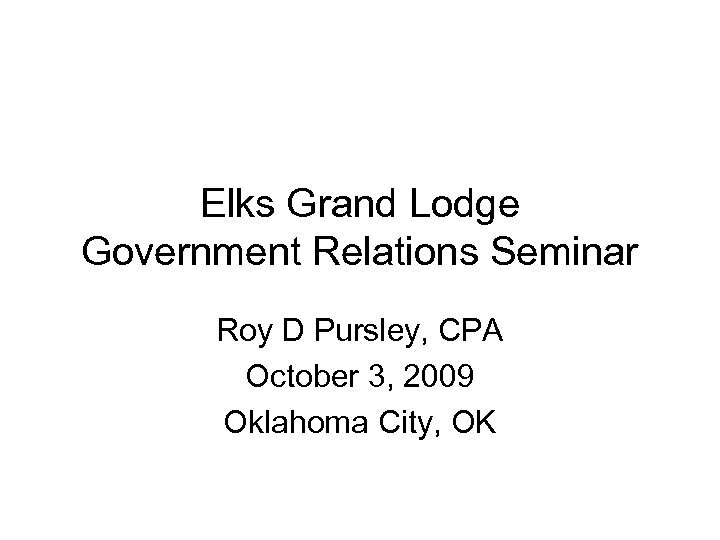 • Does any officer or Trustee perform work under contract with the Lodge? 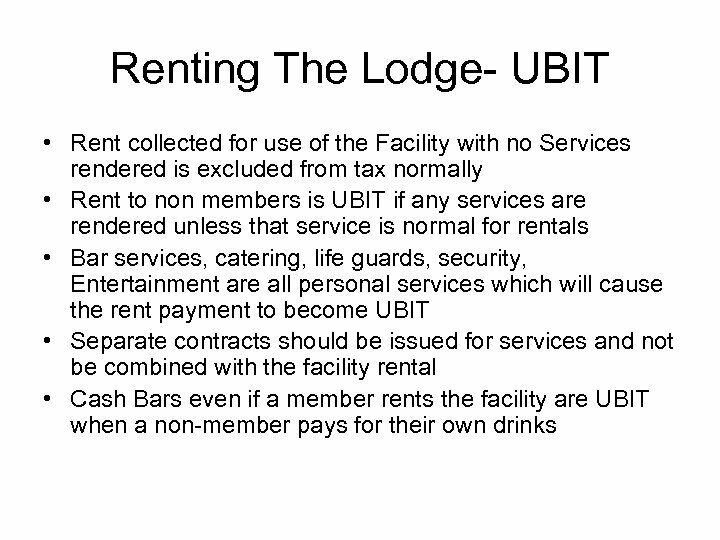 • Are Non-Members allowed in the Lodge? • Do you have a sign in book? 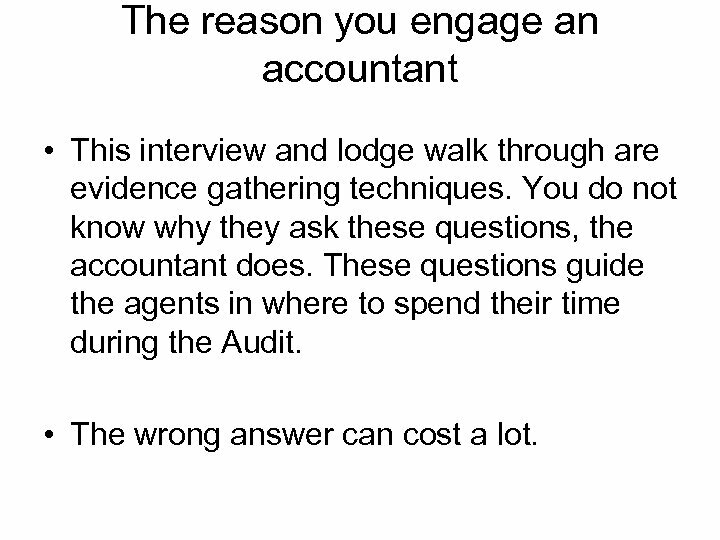 The reason you engage an accountant • This interview and lodge walk through are evidence gathering techniques. 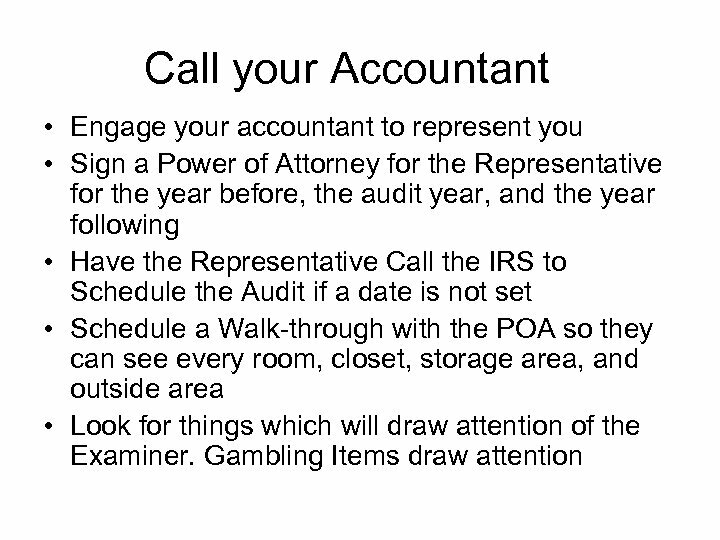 You do not know why they ask these questions, the accountant does. 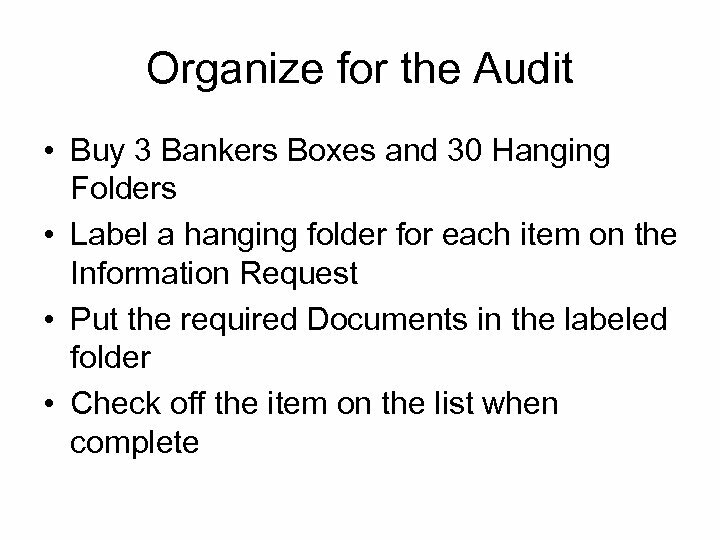 These questions guide the agents in where to spend their time during the Audit. • The wrong answer can cost a lot. 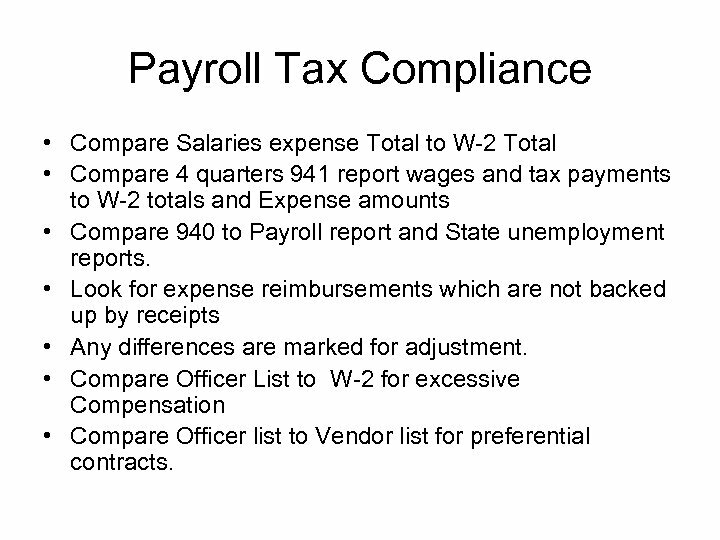 Payroll Tax Compliance • Compare Salaries expense Total to W-2 Total • Compare 4 quarters 941 report wages and tax payments to W-2 totals and Expense amounts • Compare 940 to Payroll report and State unemployment reports. 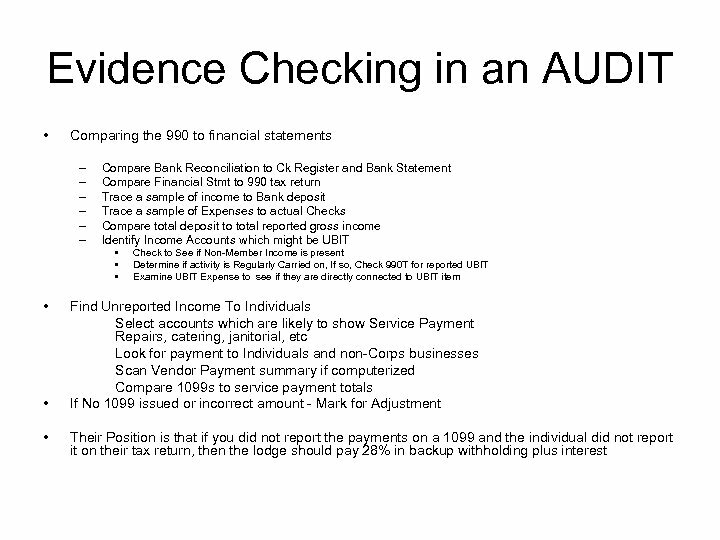 • Look for expense reimbursements which are not backed up by receipts • Any differences are marked for adjustment. 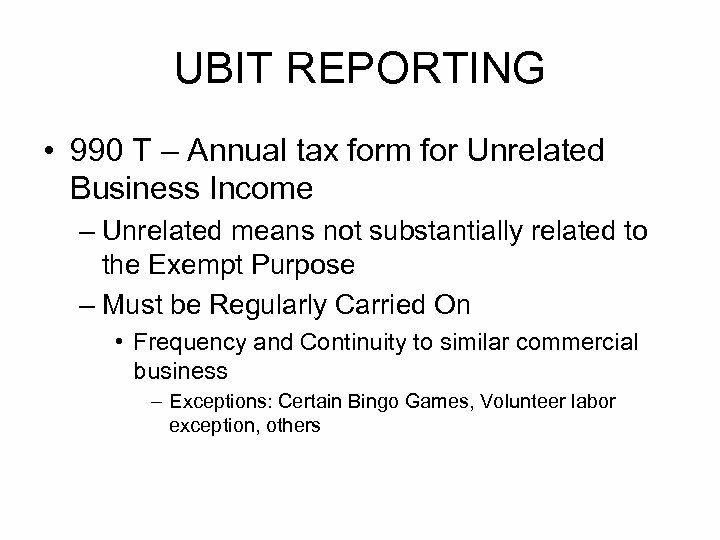 • Compare Officer List to W-2 for excessive Compensation • Compare Officer list to Vendor list for preferential contracts. 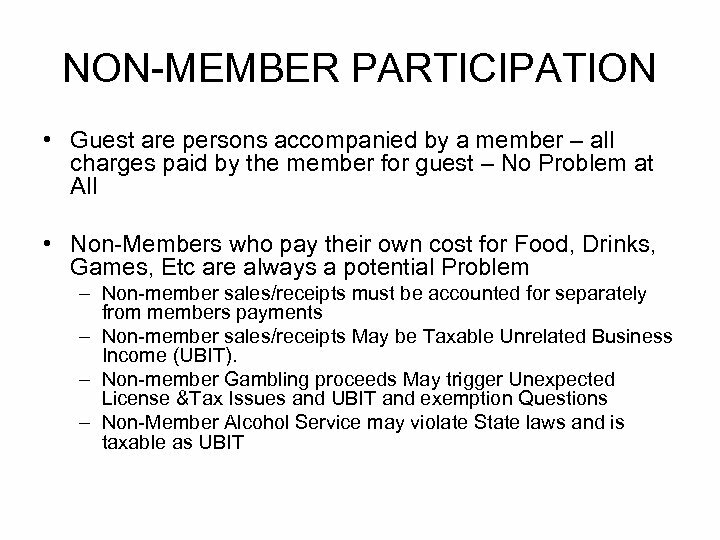 How do you tell who is member? 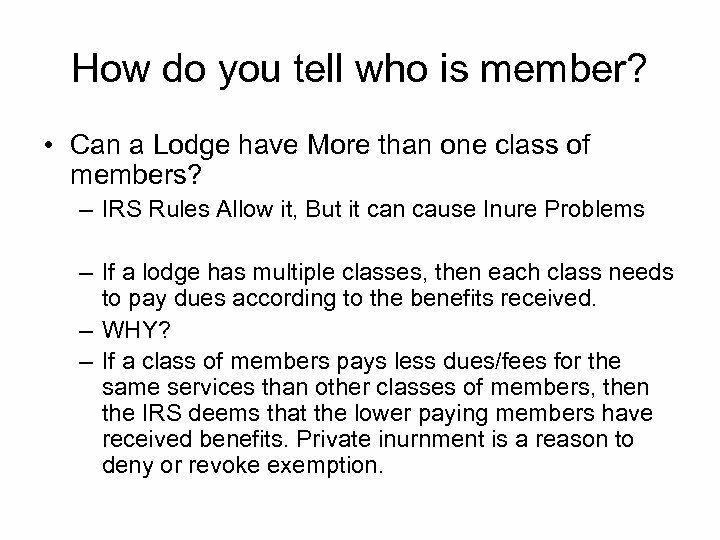 • Can a Lodge have More than one class of members? 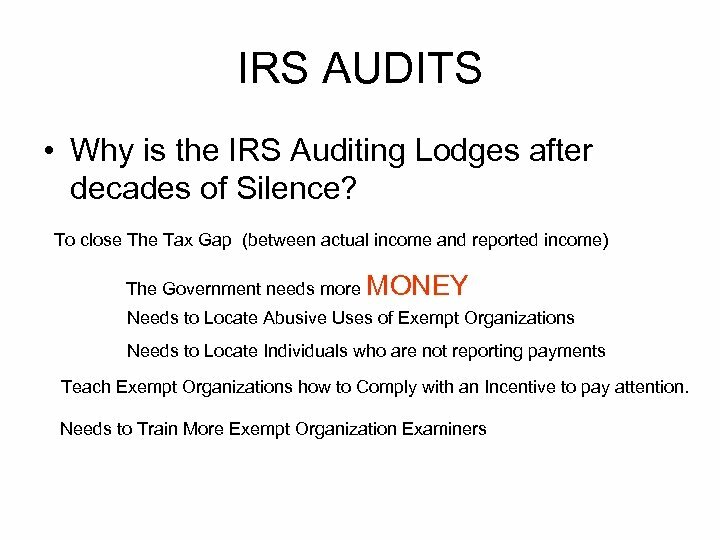 – IRS Rules Allow it, But it can cause Inure Problems – If a lodge has multiple classes, then each class needs to pay dues according to the benefits received. 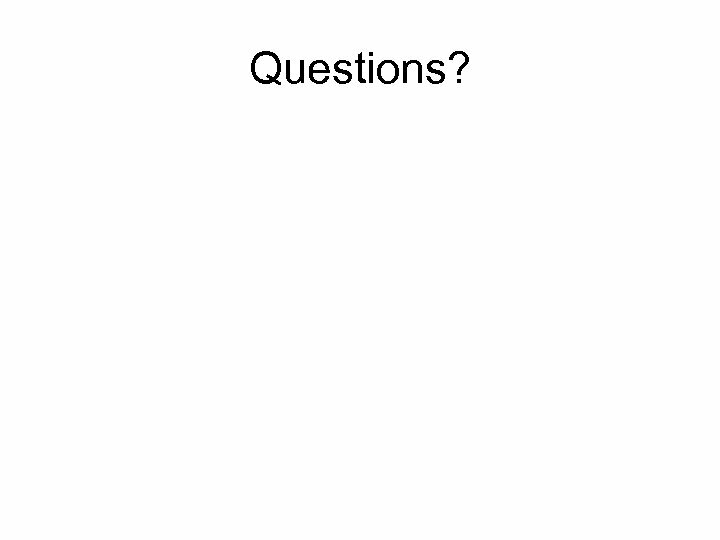 – WHY? 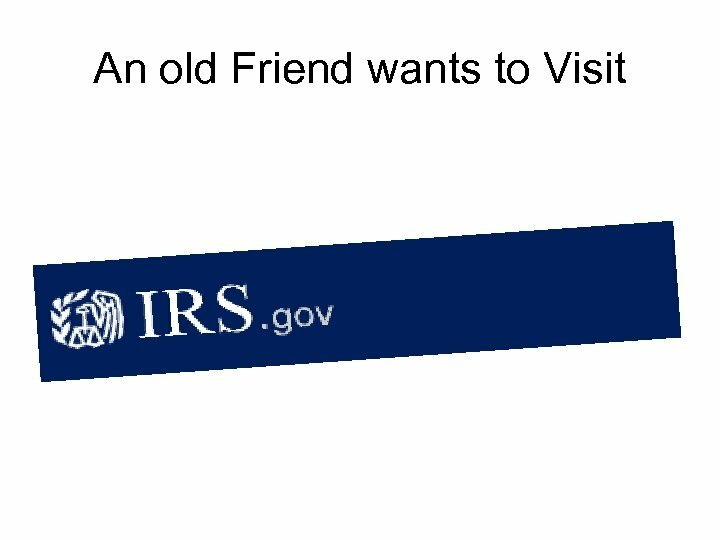 – If a class of members pays less dues/fees for the same services than other classes of members, then the IRS deems that the lower paying members have received benefits. 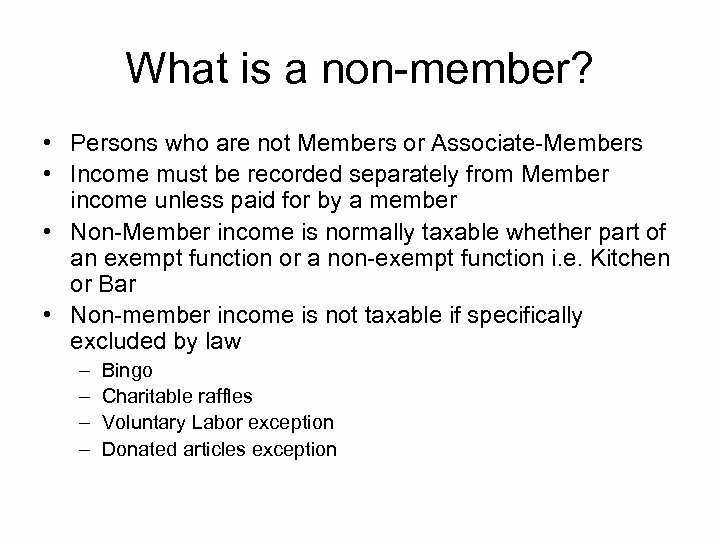 Private inurnment is a reason to deny or revoke exemption. 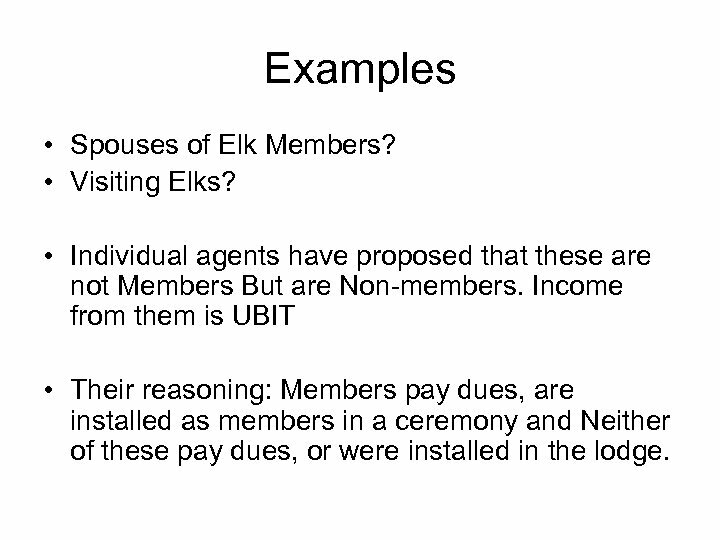 Examples • Spouses of Elk Members? 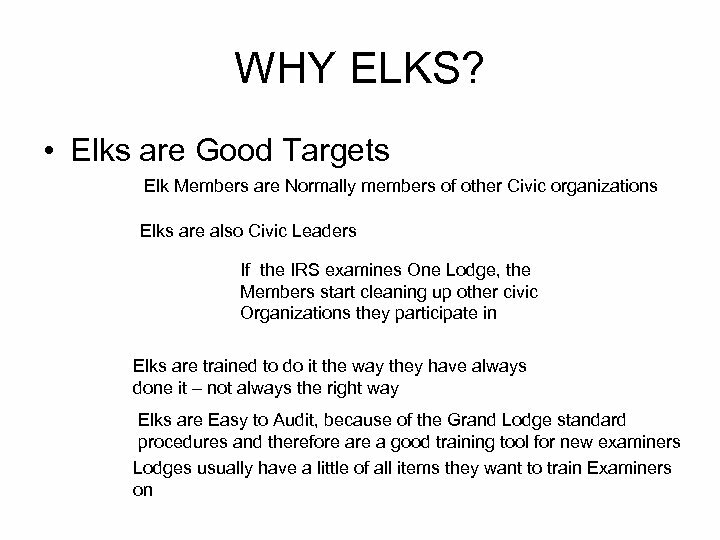 • Visiting Elks? 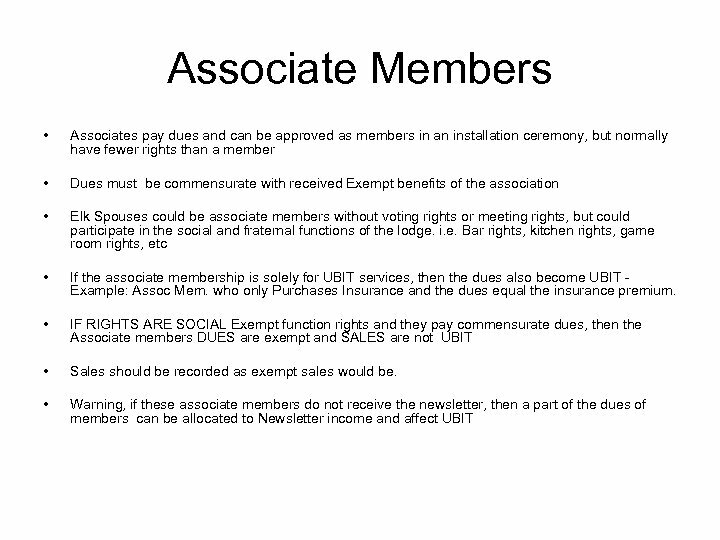 • Individual agents have proposed that these are not Members But are Non-members. 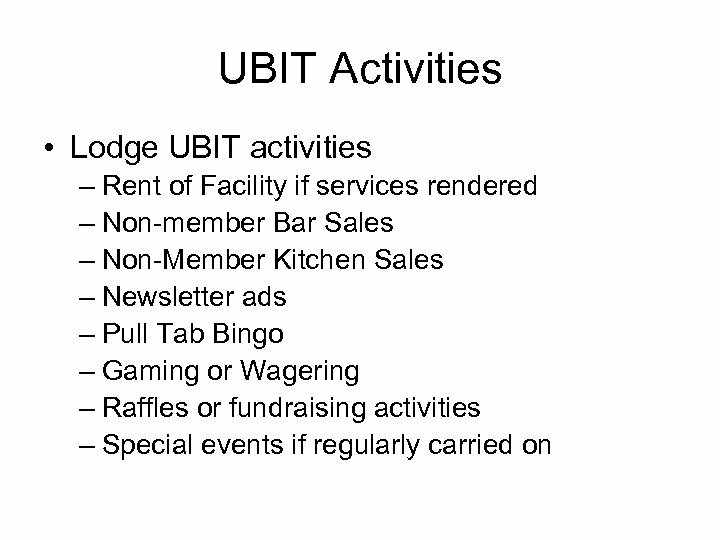 Income from them is UBIT • Their reasoning: Members pay dues, are installed as members in a ceremony and Neither of these pay dues, or were installed in the lodge. 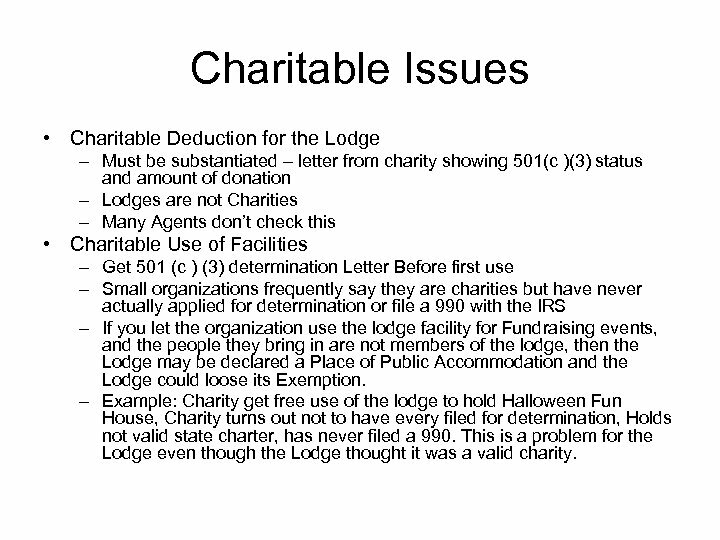 Charitable Issues • Charitable Deduction for the Lodge – Must be substantiated – letter from charity showing 501(c )(3) status and amount of donation – Lodges are not Charities – Many Agents don’t check this • Charitable Use of Facilities – Get 501 (c ) (3) determination Letter Before first use – Small organizations frequently say they are charities but have never actually applied for determination or file a 990 with the IRS – If you let the organization use the lodge facility for Fundraising events, and the people they bring in are not members of the lodge, then the Lodge may be declared a Place of Public Accommodation and the Lodge could loose its Exemption. 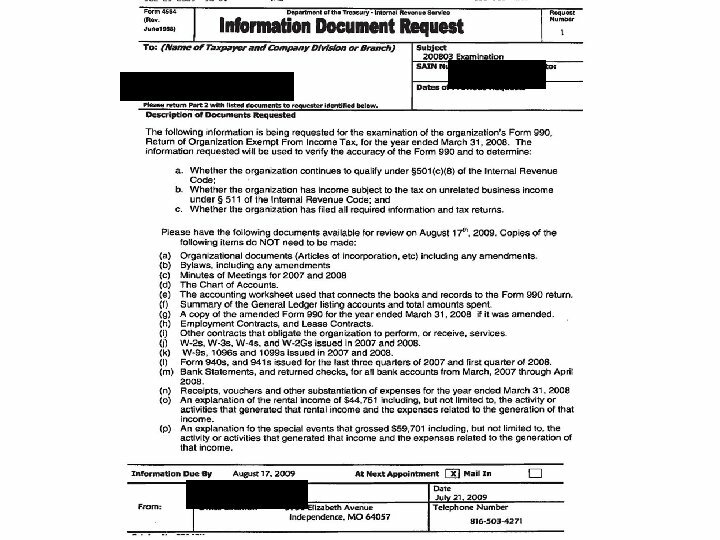 – Example: Charity get free use of the lodge to hold Halloween Fun House, Charity turns out not to have every filed for determination, Holds not valid state charter, has never filed a 990. 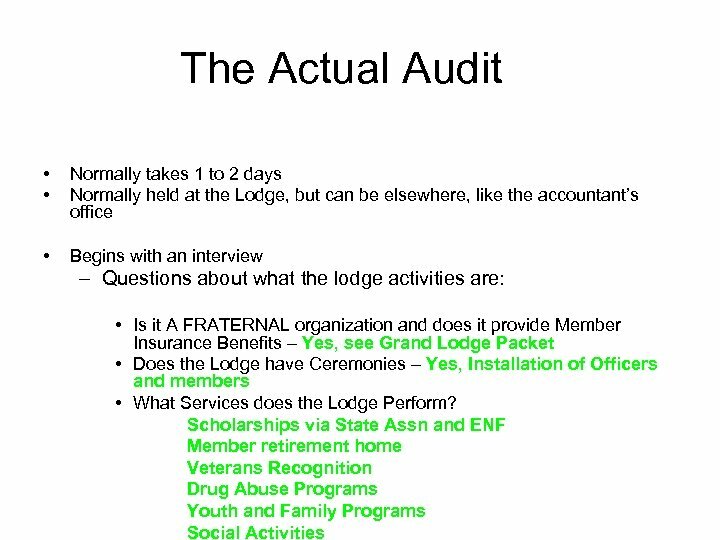 This is a problem for the Lodge even though the Lodge thought it was a valid charity. 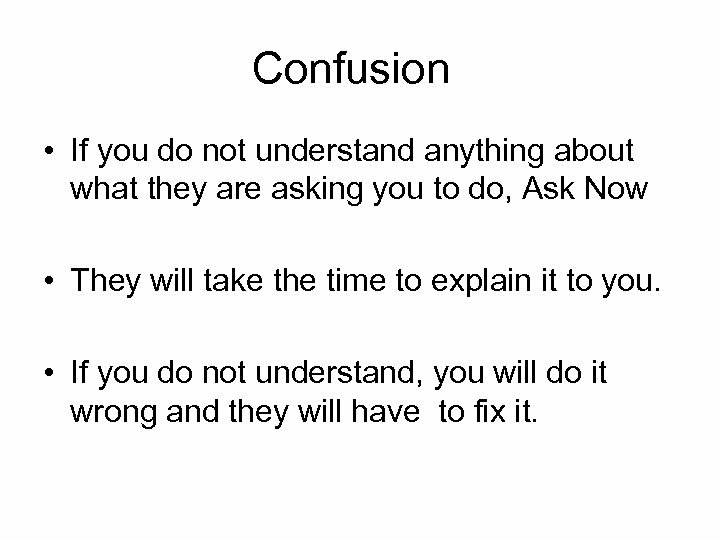 Confusion • If you do not understand anything about what they are asking you to do, Ask Now • They will take the time to explain it to you. • If you do not understand, you will do it wrong and they will have to fix it. 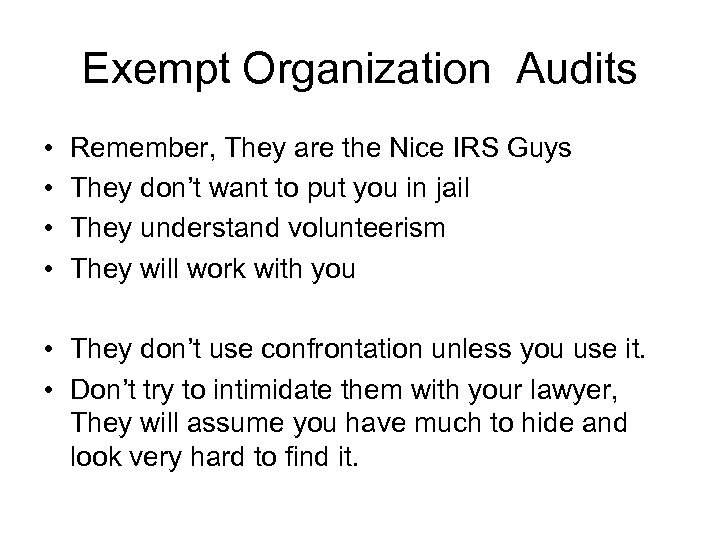 Exempt Organization Audits • • Remember, They are the Nice IRS Guys They don’t want to put you in jail They understand volunteerism They will work with you • They don’t use confrontation unless you use it. 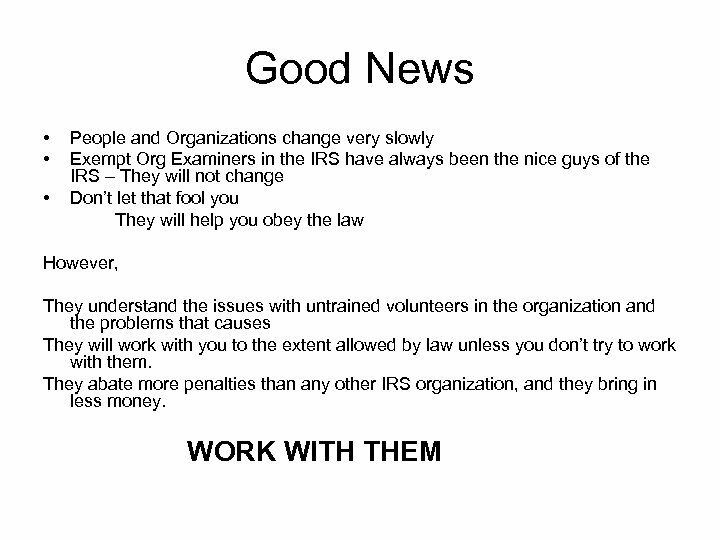 • Don’t try to intimidate them with your lawyer, They will assume you have much to hide and look very hard to find it.